Ok so this may not be applicable if you go to a very rehab based and slow mat class but for the vast majority of Pilates classes done at a higher intensity and particularly our classes in Pilates Plus Dublin you will absolutely sweat during the class. This surprises a lot of people when they first come to class. We have had a Professional Rugby player and a UFC Fighter in class who were absolutely shocked at how much they were sweating after their first class. The UFC fighter actually came over to me saying he looked like he had taken a shower fully clothed, and he was right! Another common comment I hear, particularly from men, is that Pilates is stretching and breathing. Well yes whilst both of these elements are important parts of a Pilates class it could not be further from the truth. Our exercises are slow and controlled and it completely shocks most beginners when their muscles often begin shaking uncontrollably. The looks on their faces range from shock to fear to absolute amusement. But this is completely normal. Pilates and once again particularly the method we teach in Pilates Plus Dublin is designed to work your muscles to failure. It is meant to push the muscle past where it is used to being pushed, to fatigue it and make it stronger. This is based on the fact that there are so many different elements to think of when you are doing a Pilates class. It is most definitely a workout that combines the physical and mental. You may feel lost and confused but if you choose a class with a well-trained, knowledgeable and helpful instructor this should not impact on your workout. Also the smaller the class size the better and I personally believe this applies to all exercise. If you are in a large class with one instructor they absolutely cannot devote the attention needed to you during that class, as they cannot be everywhere at once. If you go to a smaller class there is far less chance that you will be ‘missed’ if you are doing something wrong. This is supremely important when it comes to injury prevention. Pilates involves so much thinking it has been proven to help in the prevention of age related dementia etc. 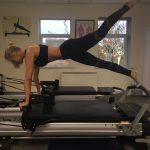 Pilates will not only provide you with aesthetic benefits which of course are usually very important to most of us, it will also have huge health benefits. Personally for me this is the number one priority of exercise, the weight loss and body shape changes are an added benefit, albeit a brilliant one. Pilates is resistance training so it will help with bone density. This is particularly important for women as we age, women unfortunately are more prone to suffering from Osteoporosis and Osteopenia. Doing resistance training will help stave off these illnesses and also help you if you already are experiencing a loss of bone density. Pilates will also increase your BMR, Base Metabolic Rate, which means your metabolism works more effectively and you burn more calories at rest. It will also help you increase your lean muscle mass and correspondingly the percentage of fat in your body. Unfortunately the percentage of body fat in your body increases with age doing Pilates will help reduce this. Pilates offers a massive range of holistic health benefits. It is a superb stress reliever and helps with mental health and acuity. I personally believe that exercise should be fun and enjoyable. For most people if it feels like a chore and you are pushing yourself to do it you will not challenge yourself enough and you may even give up. But if you are enjoying what you are doing there is far more chance you will stick with it and see massive benefits. 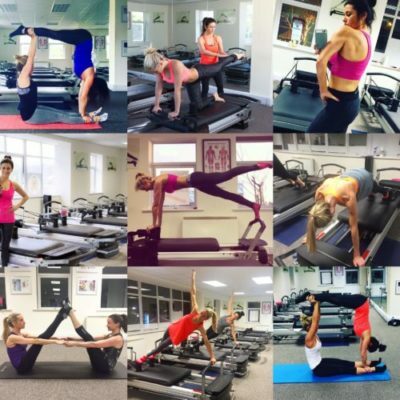 Our classes in Pilates Plus Dublin are very tough there is no doubt about that are there are moments in class when I know clients would hit me if they could BUT they absolutely enjoy it and they love the feeling they get after a class. Wherever you exercise there should be camaraderie in class and the atmosphere should have a good feel to it. 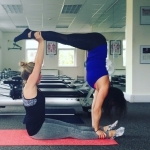 This is genuinely one of my favourite things about Pilates Plus Dublin, we have such a lovely clientele and the rapport between instructors, instructors and clients and also between clients is brilliant. My very first client still comes to my classes which I love.